"Durian (aka King of Fruits) is one of my favorite fruits and can be bought at most Asian supermarkets. This exotic fruit is very aromatic and one must have an acquired taste for it, but it adds a nice touch to cheesecake. 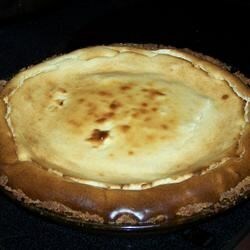 I incorporated durian into my usual cheesecake recipe and it came out delicious!" If not using canned or frozen durian puree, cut into husk of a durian fruit and remove one segment of the pulpy inner flesh. Place in a bowl and use a fork to mash the flesh. Reserve 1/4 cup. Beat the cream cheese until fluffy. Add the condensed milk and continue beating until smooth. Beat in pureed durian, eggs, sour cream, vanilla extract, and durian or banana extract. Pour the batter into prepared graham cracker crust. Bake 1 hour or until filling is set and edges are lightly browned. Serve warm or chill overnight in the refrigerator. Durian, a large fruit from Southeast Asia, has a dark green to brown husk studded with prickly thorns concealing pale yellow to red flesh. Both the fruit and canned or frozen pureed durian can be found in most Asian supermarkets. Some find durian's strong odor offensive, but the reward is its creamy flesh with a nutty, slightly sweet taste.